Gasman Coulee bridge after a tornado destroyed it in 1898. 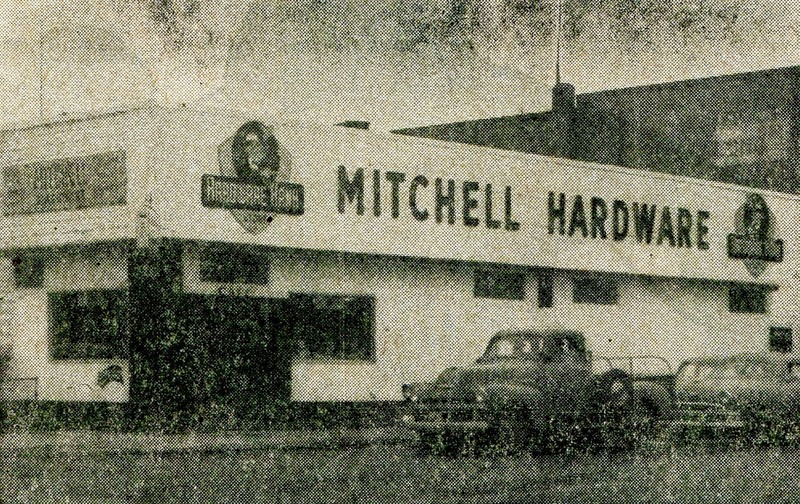 At one time Alhood Motors was located on Highway 83 South … the location was close to the intersection of what is now South Broadway and 31st Avenue SW. Alhood Motors was the authorized dealer for Sunbeam automobiles, part of the Rootes Automotive Group from England. Sometime in the mid 1960’s, Chrysler Motors acquired Rootes Automotive. The flagship sports car of the group was the Sunbeam Alpine. 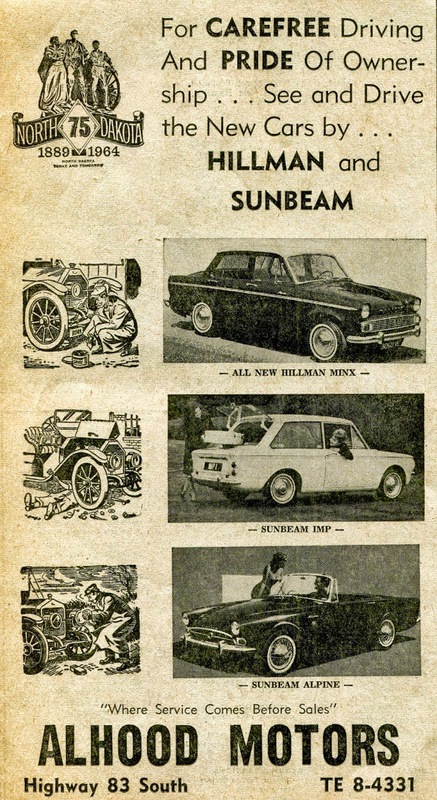 After Chrysler acquired them the Sunbeams came with the 5 year / 50,000 mile Chrysler warranty. the ad below is from 1964. Puppy Dog Coulee starts way southwest of Minot and flows through Minot eventually ending up on the east side of town by Eastside Estates. 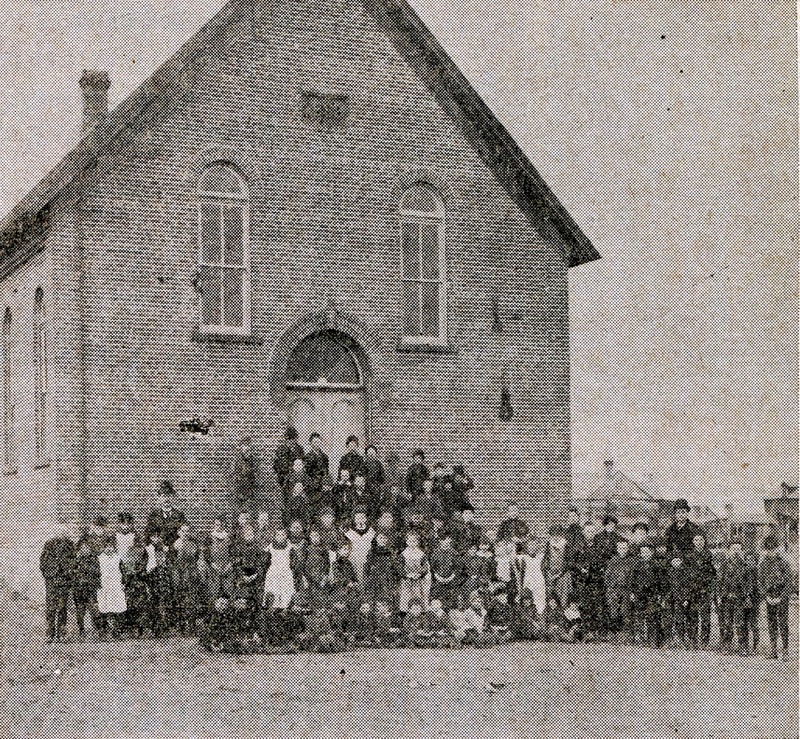 I have been curious as to how Puppy Dog Coulee received its name ..Two people have given their versions of why it is named what it is …..Jeana DeTienne Walsh - That property was owned by Ernest Livingston. Ernest told me this when I asked him about 1972 or so. He named it that because the year he bought it he found an abandoned litter of puppies there. The name stuck. Ann Krause It was called Puppy Dog because of the salamanders that lived there. They were referred to as Mud Puppies. She played down there as a kid, plinked cans etc. Her parents owned a business on the edge of the coulee. 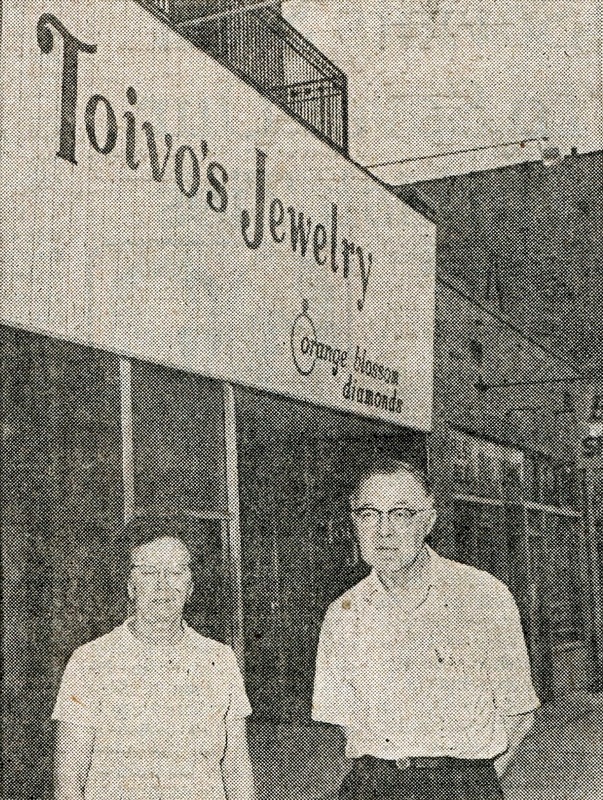 Toivo and his wife Edna started Toivo’s Jewelers in 1958. Toivo’s Jewelers was located at 16 First Street SW, just north of American State Bank. Toivo had to close the store closed in 1979 due to poor health. In his closing ad, Toivo stated that his merchandise was not marked up as prices increased, thereby giving his customers the opportunity to purchase items at discount prices. On top of that, Toivo’s was offering additional discounts of 25% to 50% off. 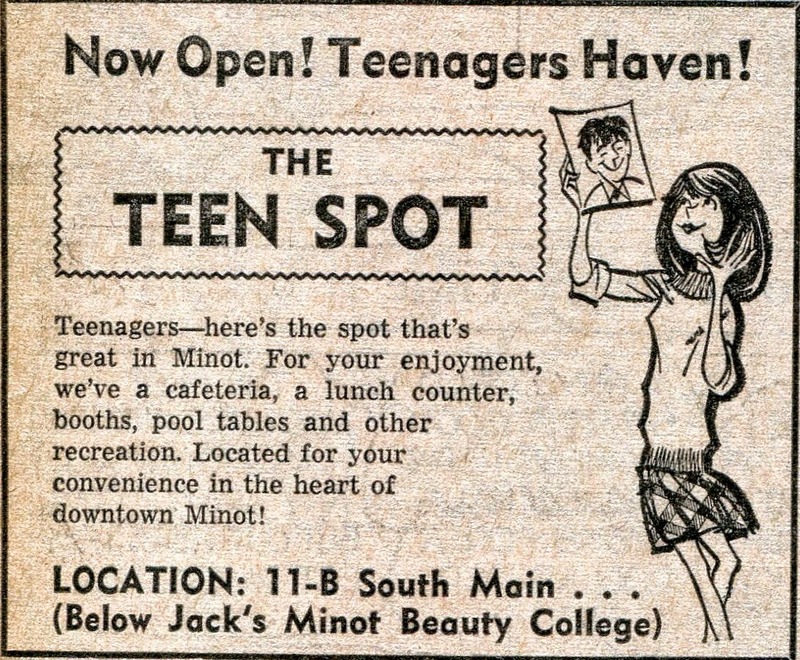 The Teen Spot – Going through old newspapers from 1966 I came across an ad for The Teen Spot. It was located at 11-B south Main, below Jack’s Minot Beauty College. The Teen Spot was advertised as a Teenager’s Haven. They had a cafeteria, a lunch counter, booths, pool tables and other recreation. Located in the heart of Downtown Minot. I graduated from Minot High in 1966 and this opened after my graduation.. I have no memory of this business and no idea how long it lasted. Perhaps someone out there can fill in a few of the blanks. I do remember the Downtowner – located on First Street SE across the street from the Clarence Parker Hotel. One who survived the Westland Oil Fire was an airport employee named Hobart Myers. He had gone to the scene to see what was happening and decided to try and help. When the flaming gasoline covered his body he dived into a sand pile at a nearby construction site. Myers was rushed to St. Joseph’s Hospital for treatment of severe burns. His coveralls were still smoldering when he arrived at the hospital. His clothing reportedly burst into flames again, burning a nurse who was caring for him. Myers suffered severe burns and had to go skin grafts. He was a patient at St. Joe’s Hospital for over eleven months before returning home. 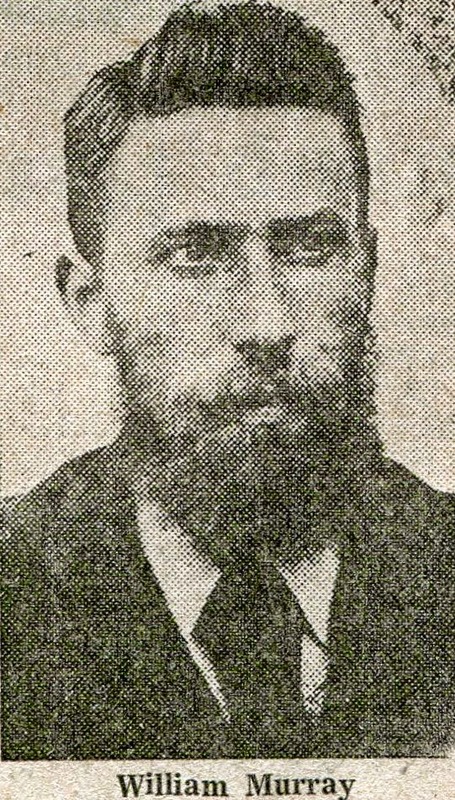 Myers later became a custodial worker at the Ward County Courthouse and passed away in 1958. 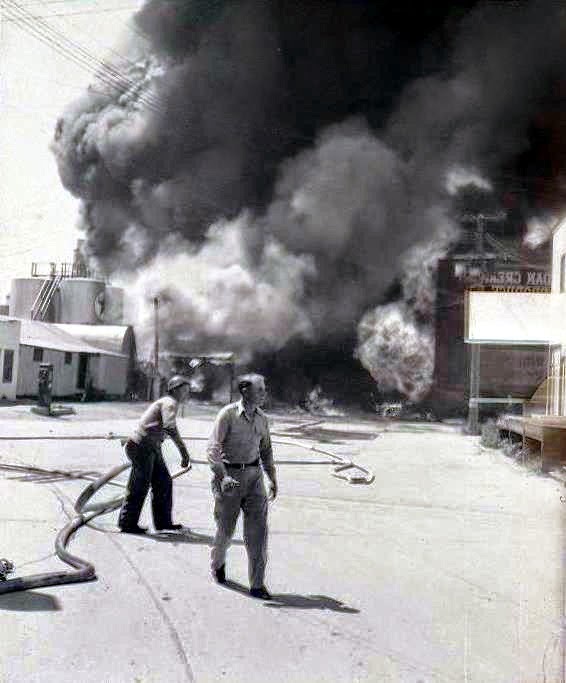 The Westland Oil fire occurred in July of 1947. The cause of the fire may have been attributed to “pink gas’ flowing out of one of the tanks. This was reported by someone from the Bridgeman Creamery. She claimed she saw the “pink” gas coming out of one of the tanks and decided to leave at once. As she was driving away the explosion pushed her car down the street but she escaped without injuries. Many businesses were lost in the fire besides losses incurred by Westland Oil. 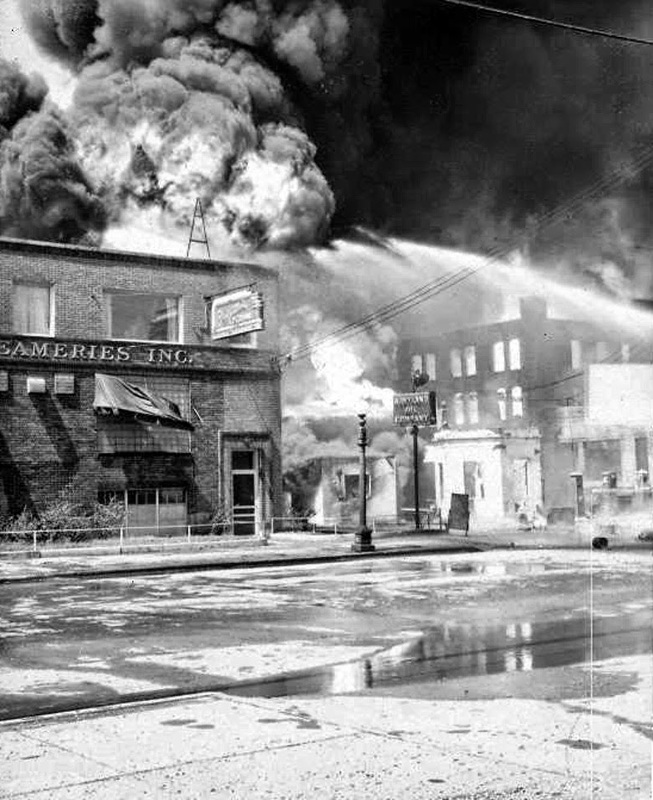 Those destroyed in the fire were: Mandan Creamery & Produce, Riverside Café & Tavern, Becwar & Cedarstrom Texaco and the Minot Co-op Grain Association. Badly damaged included Bridgeman Creameries, Monagin Power Equipment Co, Farmers Union Co-op Store, and Lowe’s Grocery. Five people were killed in the fire and a number were injured. 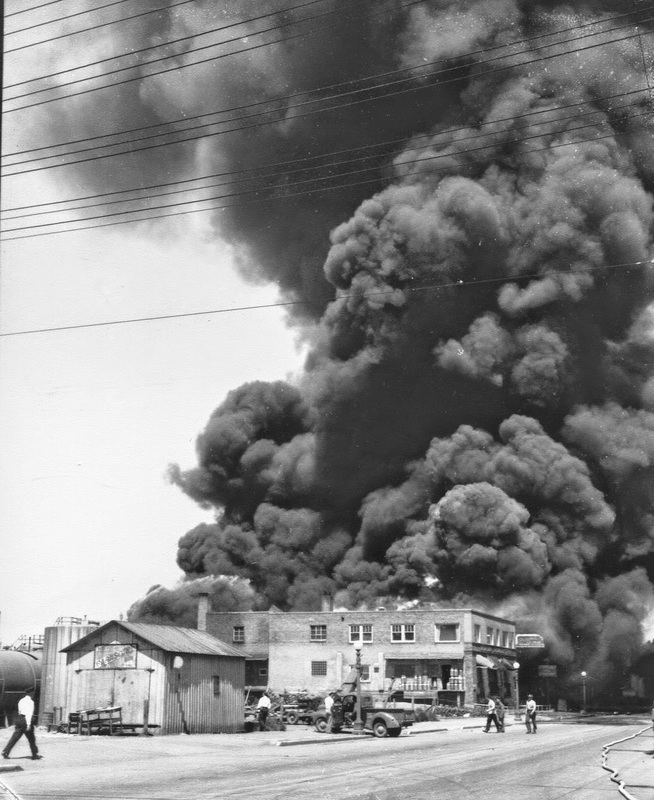 About 1:00 pm on July 3, 1928, a storage tank containing thousands of gallons of gasoline exploded causing a huge fire. 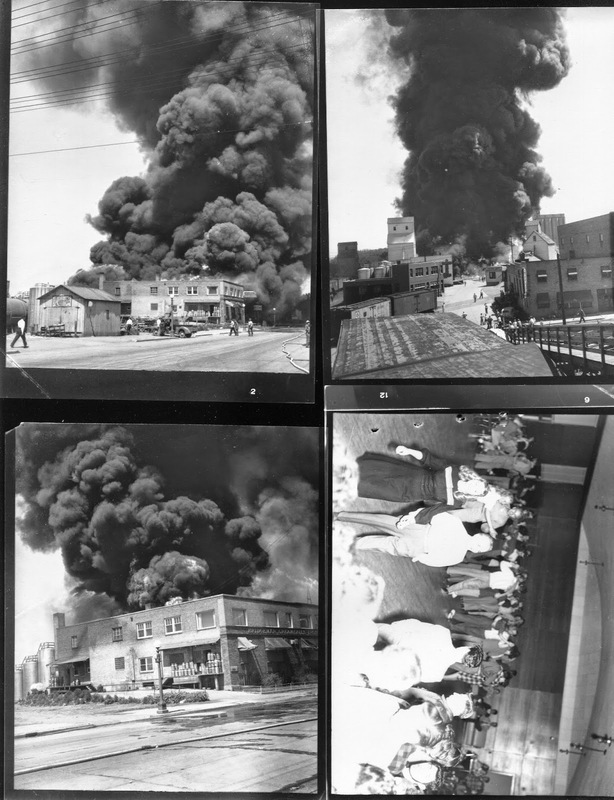 The blast shook buildings throughout Minot. International Oils was located in the area of Third Street and Central Avenue North east. The fact that the blast occurred over the noon hour accounted for fewer people being injured or killed as many were out for their lunch break. Neighboring businesses were heavily damaged and continuously doused with water to keep them from also catching fire. In addition to the International Oil Co. offices and warehouse being destroyed or heavily damaged other businesses were affected. Those included the Minot Distributing Company, Midwest Sash & Door, International Harvester, Simmons Seed Co. and Minot Farmers Co-op Elevator. 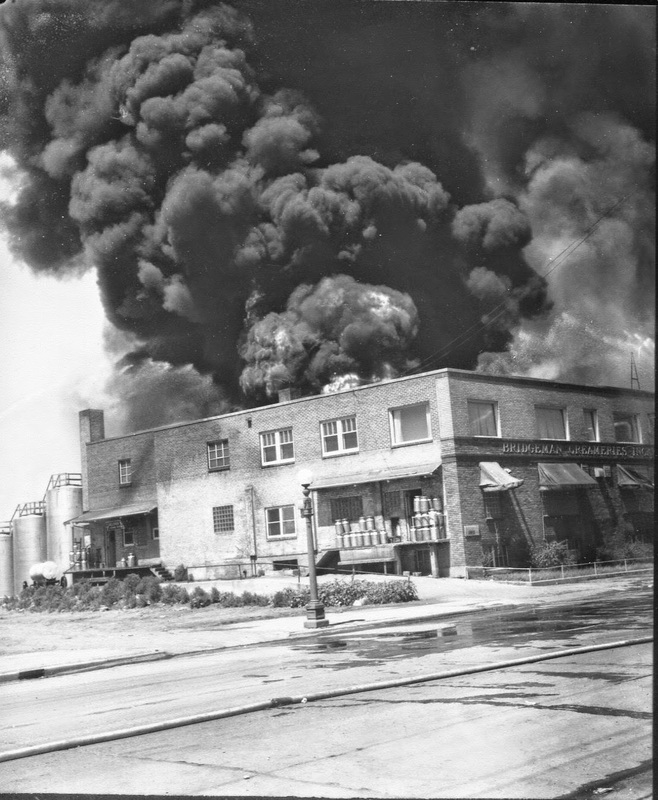 Oil Fires in Minot – In the 1900’s there were three major oil fires in the Downtown area of Minot. All three of the fires were in the same area, that being the area of Central Avenue and Third Street Northeast. In 1928 it was the International Oil Company fire, which will be discussed. In 1942 there was another major oil/gas fire which I have no information on. And the worst of the three fires was the Westland Oil Fire in 1947 in which five people perished. Because of these three major fires, large bulk petroleum plants were ordered moved out of the city limits and strict zoning and fire prevention measures were instituted. 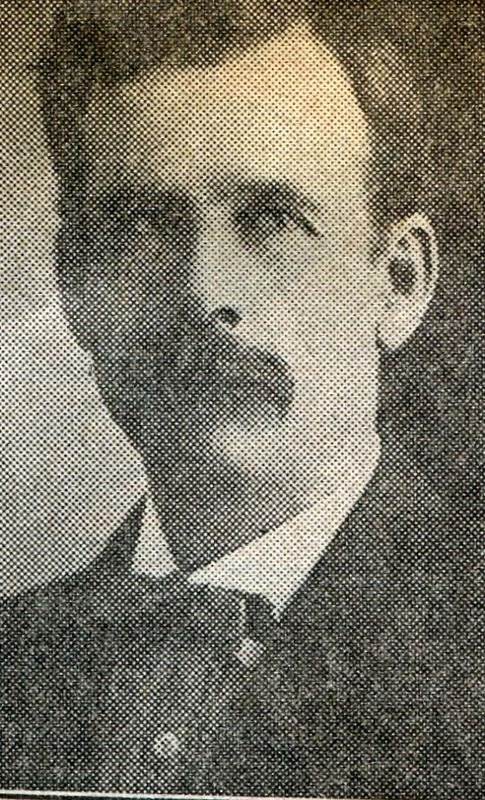 Darius Preston was the first City Attorney for Minot. When he passed away he was buried at the same site Shang Foster had been buried. On the way to the burial with Preston’s body the pall bearers stopped at Jack Doyle’s Saloon for several rounds of drinks. When they arrived at the gravesite and started lowering the coffin into the grave, one end caught on the earth wall and the other end dropped down causing the coffin to rest in a tilted position. John Powers, a rancher and one of the pall bearers, went into the grave to level the coffin as he was the tallest and the strongest. He became trapped in the grave as his feet were wedged between the coffin and the wall of the grave. Apparently his fellow pall bearers did not realize this and started filling in the grave. Unable to free himself Powers began calling for help. His cries were heard by Judge William Murray and a furniture dealer John McJannet. They rushed to the grave to find Powers buried almost to his shoulders. They helped extricate him from the grave. William Murray, the judge in the trial, was a native of Dumfries, Scotland. He arrived in on the train Minot literally hours before the shooting of Shang Foster by Roxy Queal. When the train that Murray was on pulled into Minot, the Conductor, Casper Sands, warned passengers… “Minot, the last stop Minot, prepare to meet your God! !” Apparently Murray was in the saloon at the time of the shooting. In an interview later he recalled that Foster fell almost at his feet. Queal was locked up in the Ward County Imperial Jail. He did escape but was again apprehended and tried. He pleaded self-defense and was sentenced to 4 years in the penitentiary but was out on parole after 18 months. After the shooting, Foster was buried on the side of a hill near the intersection of what is now 4th St SW and Burdick Expressway. Gunder Reishus suggested an epitaph for Foster…. “Beneath these stones repose the bones of the first outsider to try to outsmart a Minot Man”. Tomorrow and Friday more stories connected to this event. In one version Roxy Queal and Shang Foster argued about a debt of $20.00 that Queal owed Foster. Foster gave Queal a deadline of 4:00 pm to pay up or he was going to find him and kill him. Queal, knowing that Foster was drinking at Jack Doyle’s Saloon walked in and bought him a drink as they were standing at the bar. Knowing he could not repay the debt, Queal then pulled a gun and shot Foster at point blank range. Killing him on the spot. Queal then ran out of the saloon and was free for a short time He was captured a short distance from away after he boarded a train leaving Minot. The first murder in Minot took place in August 1887 at Jack Doyle’s Saloon. 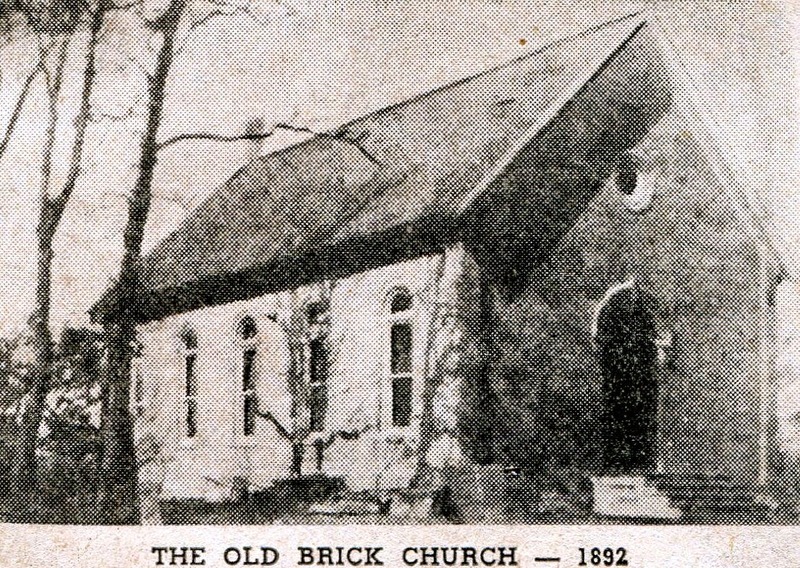 The Saloon was located on what is now Central Avenue close to Main Street. Shang Foster was shot and killed by Roxy Queal. It is agreed that at one time the two were at least acquaintances if not friends. Foster was a known gambler who spent time in the Black Hills area when he was run out of Minot, which apparently was quite often. Gunder Reishus, a Minot resident for whom Reishus Avenue was named was visiting with John Cooper in front of Cooper’s Jewelry when the shots were fired. They ran to Jack Doyle’s Saloon to see what had happened. There seems to be two versions of how the infamous event occurred. Tomorrow we will look at Version 1.